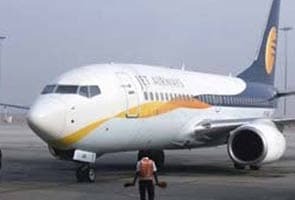 Mumbai: A day after budget carrier SpiceJet announced fares starting at Rs 499 across its domestic network, Jet Airways has also jumped on the bandwagon rolling out Rs 500 fare for the economy class on domestic flights for a limited period. The all-inclusive fares of the Mumbai-headquartered carrier start from Rs 500 excluding statutory taxes. Customers will be able to enjoy these discounts across all destinations on the airlines' domestic network, Jet Airways said in a release. Bookings under the offer, however, can be made only in two days starting Wednesday, the airline said. The scheme is for travel from January 16, 2015. Jet further said the offer is valid for travel only on direct flights on its domestic network and does not cover group bookings. SpiceJet, which has been rolling out heavy discounts on its ticket prices starting January this year, had on Monday claimed to have sold more one lakh tickets in a single day under its Rs 499 scheme. AirAsia India currently operates in the Bangalore to Kochi, Chennai, and Goa sectors. From September 5, AirAsia India will start flights from Bangalore to Jaipur and Bangalore to Chandigarh. This would be the budget carrier's first push into north India.